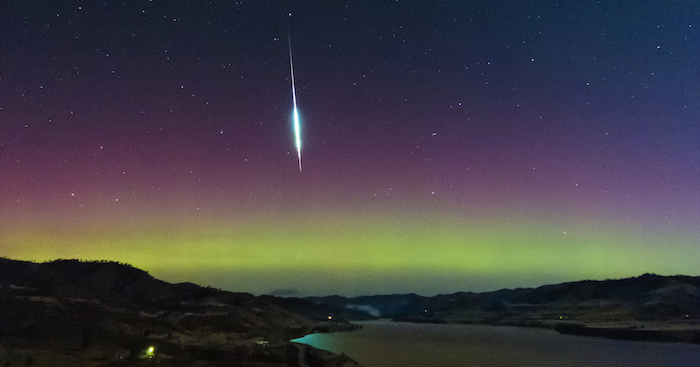 A fireball from the Taurids meteor shower against the Northern Lights near Keller, Washington. Photo taken Nov. 3, 2015, by Rocky Raybell (CC). The Taurids are an annual meteor shower, like no other, originating from the particles of Comet Encke. The name “Taurids” comes from the constellation Taurus the Bull because Taurid’s meteors look like they originate from there. 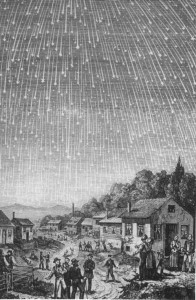 It’s believed that Encke and the rocky particles causing the Taurid meteors are remnants of a much larger comet that crumbled over the past 20,000 to 30,000 years, breaking into several pieces. Because the meteor stream is so spread out in space, it takes Earth several weeks to pass through it. In fact, we see separate segments of the stream (the Northern Taurids and Southern Taurids) as distinct meteor showers. All told, this stream of cometary debris is the largest in the inner solar system. According to the American Meteor Society, the Taurids aren’t known for high numbers of meteors, but for the fireballs – extremely bright meteors – they produce. Because the comet is made up of of heavier material, pebbles as opposed to grains of dust responsible for fainter meteors, the particles entering Earth’s atmosphere create even brighter fiery trails. Unlike many other meteor showers, the Taurids is as strong in the evening as it is in the morning. Because these meteors streak all over the sky, you don’t have to be looking directly toward the constellation Taurus to see them. The Northern Taurids are expected to peak Nov. 11-12. 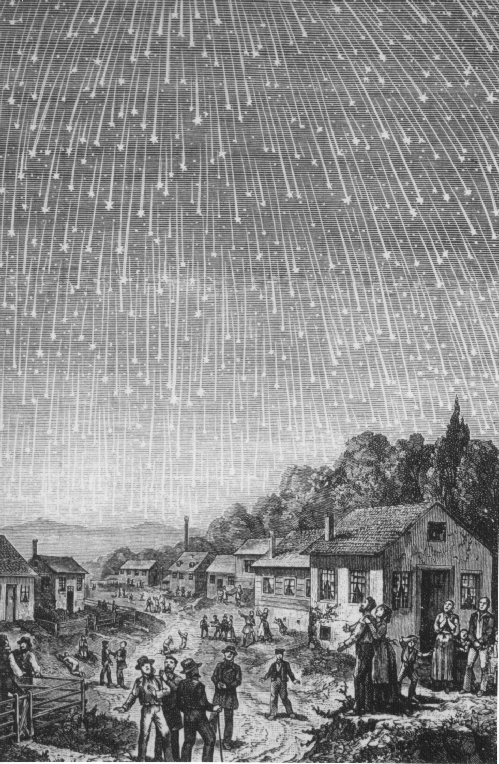 The most famous depiction of the famous 1833 Leonids Meteor Storm. The engraving, by Adolf Vollmy, is based upon an original painting by the Swiss artist Karl Jauslin. It’s unlikely that this year’s show will come even close to The Great Leonid Meteor Shower of 1966 – Leonid meteor storms cycle about every 33 years – but that doesn’t mean there won’t be some meteors to observe. The Leonid meteor shower is expected to peak in the early morning hours of the Nov. 16-17, though under the bright light of waning gibbous moon. Find a wide-open viewing area and don’t use a telescope or binoculars. You don’t want to limit the amount of sky you can see at one time. Your eyes will work just fine. If possible, get out of town and travel to a dark place away from artificial lights and light pollution for the best view. Let your eyes adjust to the dark. Prepare to wait: Bring something to sit or lie down on. Meteors are a waiting game, so get comfortable and be prepared to relax and enjoy the event! Next post: Get Your 2017 IDA Calendar!